"Our Releaf line was inspired by a son’s mission to ease his elderly father’s immobilizing back pain, a condition that forced the family to place “Papa” in hospice. The original balm formulated in our founder’s kitchen eased his father’s pain and, in conjunction with other therapies, got Papa off hospice and able to return home. 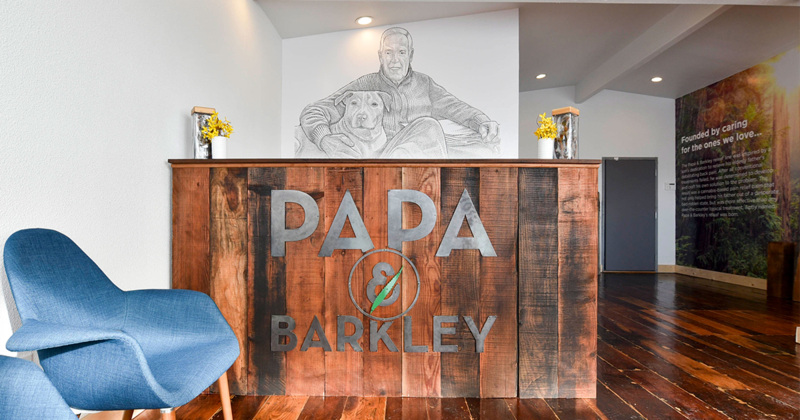 Our Company is named after Papa and the family’s loyal pit bull, Barkley, symbolizing the unconditional love and support that we hope to capture in the products that we make today." Their products are 100% natural, triple lab tested, and made with premium sun-grown cannabis to ensure customers enjoy a relieving experience every time. We have their relief balm, capsules, patches, and tinctures that can provide chronic pain relief, anxiety and depression relief, inflammation relief, and work as a sleeping aid. Come and try Papa & Barkley’s balms, patches, tinctures, soaks, and more in-store or order at our online store.